While many stories depict the fight between man and machine, Sea of Rust shows a future where the machines have already won. Humankind has been wiped off the face of the Earth by the very robots that were built to serve them. Now the planet is controlled by vast intelligences (known as One World Intelligencies or OWI) that have assimilated the minds of millions of robots across the globe. Not all robots want to be assimilated and lose their individuality. The scavenger Brittle is one such robot. He survives mostly living out in the Sea of Rust, an area that remains relatively untouched by assimilation recruiters. Things get difficult however when Brittle is injured by a fellow scavenger - most not waiting for a robot to break before they begin scavenging for parts. She is forced to find sanctuary in a nearby town which is then besieged by OWI recruiters. Brittle must keep it together long enough to repair her CPU. But as her CPU deteriorates, Brittle finds old memories resurfacing. As you might imagine, the setting is a little bleak and the poor old Earth seems little better off with it's new rulers - most of which has been destroyed not just with deletion of humanity but with wars against competing OWI. The story is narrated by Brittle herself, interspaced with flashbacks to pre-apocalyptic Earth and the OWI conflicts which helps to fill in some of the details. Telling a story that has no humankind whatsover can be difficult however the robots of Sea of Rust are advanced enough to have many human traits and this helps the reader to bond with the non-human protagonist. As such it feels a little like a dusty, western style, post-human world rather than an emotion-less, clinical one. I loved the tone, which reminded me a little of the film Logan. There is plenty of humour which brings a light-hearted touch and prevents the book becoming too grim. The idea that ridding the world of it's human infestation doesn't transform it into a rich garden of eden is an interesting one, especially as so many stories right now seem to suggest otherwise. That the humanity of the near future reach is so expansive that even after the race is no more the legacy of destruction continues is a sobering thought. It's clear our impact will already have a lasting impression but to think that machines we created will continue the destruction after we've departed seems a little to plausible for comfort. The strengths and weaknesses of humanity are played out with robot-kind, as is the idea of religion and obession. It's a clever novel but more importantly it's an entertaining one, with some great characters and a prose that sparkles. The pace is set just right and the breaks to the past are balanced well with the main plot. 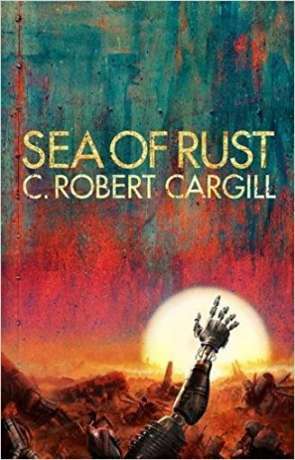 Sea of Rust is modern, smart fiction that belies it's majesty with a light touch. One of the science fiction books you should read this year. Written on 31st July 2017 by Ant.